If the firmware version is Ver.1.10 or later, the update is not required. When using an A-mount lens with the LA-EA2/LA-EA4 Mount Adaptor (sold separately) and setting to use the [AF Micro Adj.] function, the registered value is reset. 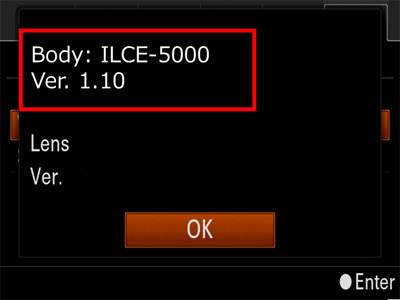 The download of the [Update_ILCE5000V110.dmg] file will start. 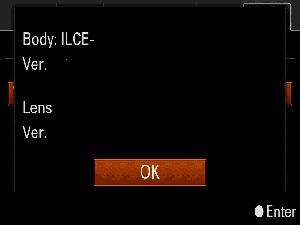 Double-click the [Update_ILCE5000V110.dmg] file you downloaded. - Do not connect the camera at this point. Double-click the [Update_ILCE5000V110] icon which appears on the Desktop. 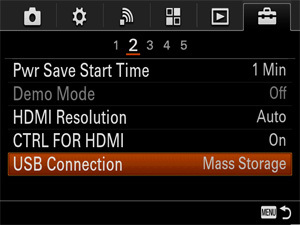 According to the instruction on the Firmware Updater window, select Menu --> Setup Subpage 2 --> USB Connection on the camera, and check if Mass Storage is selected. If the current firmware version is 1.10 or later, the update is not required. In this case stop the USB connection and click Finish, turn off the camera, remove the battery pack and/or the AC adapter, reinsert the battery or reconnect the AC adapter and turn on the camera. Confirm the firmware version of your camera is Ver 1.10. On the camera select Menu --> Setup Subpage 5 --> Version.